Yes, I know this post is late. Memorial Day threw me off. "An Obliger?" you might ask. "What is that?" 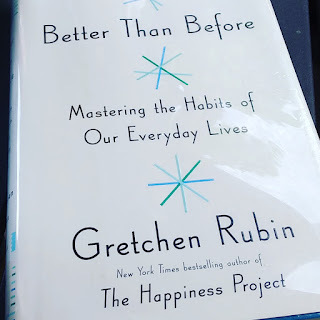 According to Gretchen Rubin in Better Than Before, "Obligers meet outer expectations but struggle to meet inner expectations.... Because Obligers resist inner expectations, it's difficult for them to self-motivate--to work on a PhD thesis, to attend networking events, to get their car serviced. Obligers depend on external accountability, with consequences such as deadlines, late fees, or the fear of letting other people down." Rubin also identifies three other tendencies: the Upholder, the Questioner, and the Rebel; but as I read this part of the book, I was in shock. "That's me!," I thought. "OMG! That is so me!" I still can't believe that someone pegged me so perfectly. So, what does this mean? How does this affect my life? Well, it means that I have a difficult time meeting all the goals I set for myself. I need accountability. I am trying some different methods of holding myself accountable. I am using trackers and offering myself rewards if I continuously meet my goals. I am very purposefully setting aside time for each activity in my day. If I continue with this long enough, this could become a habit, and I will no longer have to think about it. But maybe that is wishful thinking. After all, I am an Obliger. "In the "compelling"* and "pitch perfect"** follow up to Tana French’s runaway bestseller In the Woods, it's six months later and Cassie Maddox has transferred out of the Dublin Murder squad. But an urgent telephone call beckons Cassie to a grisly crime scene. The victim looks exactly like Cassie and carries ID identifying herself as Alexandra Madison, an alias Cassie once used as an undercover cop. Suddenly, Cassie must discover not only who killed this girl, but, more importantly, who is this girl?" I saw my double once, as a child, on vacation in the west of Ireland. We were driving on a country road, and she was walking in the sunshine. At the time I wished I could have stopped to talk to her. Now I wonder what her life was like. Did she have the same struggles and successes that I have had? How different were our lives? I can't imagine what I would do if I saw my double's dead body? When Cassie now only saw her double's dead body but also found out that her double had been living the life of one of her former undercover personalities, curiosity must have taken over. Imagine sneaking into your double's life and taking over where she left off. It would be so tempting. And her life was so different. I felt it pulling her in and surrounding her in its comfortable rhythm. The book did drag at times, but I feel it was reflective of Cassie's desire to allow the investigation to drag on, so she could wallow in her new life for a while longer. I figured out the true murderer long before Cassie did but, again, I think she hid the truth from herself as long as she could. She did not want to rush back to her real life. 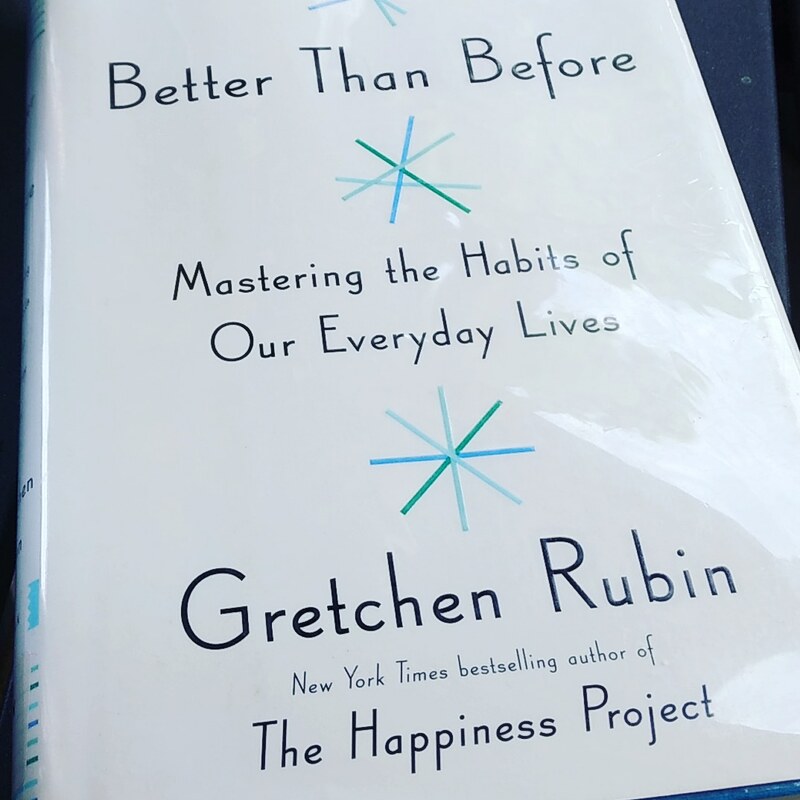 Overall I really enjoyed this book and recommend it. There are times where the story slows and the reader can put the book down and take a break. Other times it keeps you on the edge of your sear and you won't want to put it down. I can't wait to read more Tana French. 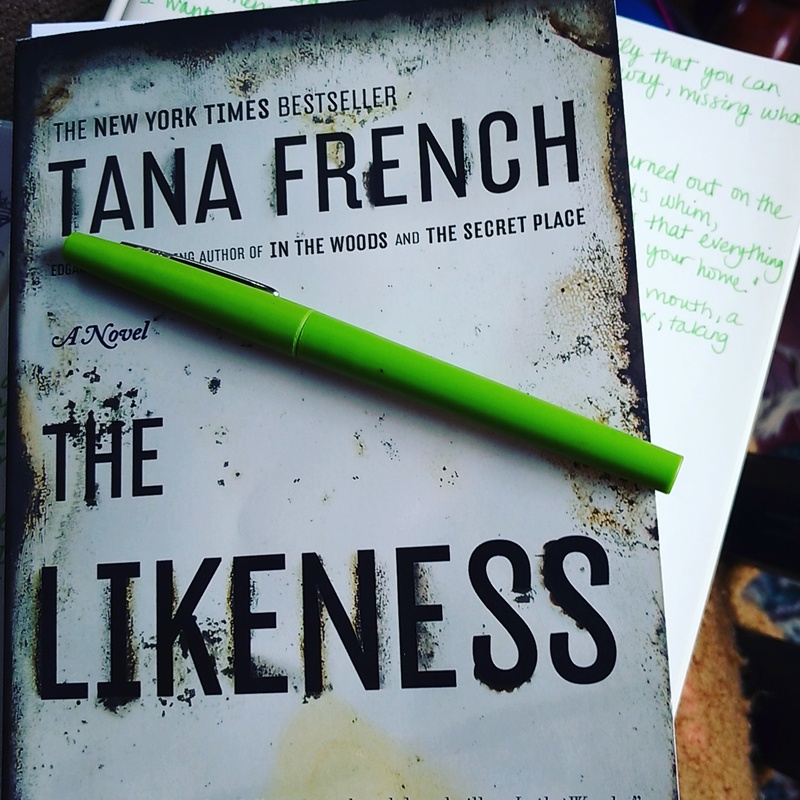 Have you ever read a book by Tana French? What did you think? On Friday morning the school where I teach went into lockdown. It was easily the most terrifying day of my life. At 9:40am, class had just begun. My students were signing into their Chromebooks, and we were joking about what would happen next in our weekly video series, Mi vida loca. "This is not a drill. Lockdown! Lockdown!" My mind immediately went blank. The students were ready. Our drills had worked. They knew what to do. But I had to stop and think. "Lockdown. That means the threat is inside the school. We have to hide from the window in the door." The lights were already off in the classroom since we were preparing to watch a video, and I always keep the door locked. There were just a few more steps to complete. I turned off the projector and my computer screen and directed the students to close their Chromebooks. 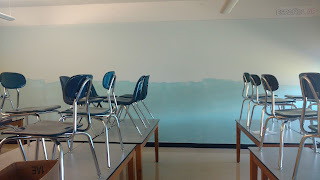 We all moved to one side of the classroom and squeezed in tight, hoping to keep ourselves hidden from the small rectangular window in the door. As I huddled with my students against the wall, I glanced around the room and quickly realized two things: there is nothing even remotely weapon-like in my classroom, and all the water bottles and Chromebooks on the desks made it painfully obvious that people were hiding in that room. My 21 students were scared; some of them were crying, all of them were on social media exchanging messages of love with each other and passing on the latest rumors about what was going on. "Someone brought a gun to school"
They already knew more than me. For the first and only time in my life I wished I was part of their group chat on Snapchat. I felt so lost. How was I supposed to protect them when I didn't even know what was happening outside our room? The door shook. We all stopped breathing for a minute. Whoever it was moved on down the hallway. "It was the police," one of my students reported. He showed me a picture of all the police cars outside the high school. Three different departments had come to help us. We stood against that wall for almost two hours before the lockdown ended. The police took three suspects into custody No shots were fired. No one was injured or killed. In that sense, we were lucky. I held it together for the rest of my work day. Then I went home, took a shower, and cried. I am not generally an emotional person, but the stress of that day was too much. I am still happy that there is nothing weapon-like in my classroom; I am happy that we all emerged from the experience unharmed; but I am sad that this now seems to be part of my job description. A recent assignment for the Ninja Writing Challenge involved visualizing my inner critic and the place I would send her when writing my first draft. I had never really thought much about my inner critic before, so this task was very interesting to me. My first thought was that my inner critic definitely wears glasses. I imagined that she probably looks just like me, but with big, thick-framed glasses. Then a clearer picture started to form. I'm pretty sure that my inner critic is a version of my 8th grade English teacher, Mrs. Claus. Yes, that was her real name, Mrs. Claus, no relation to Santa, although she did always wear red. Red from head to toe. I think my inner critic is a lot like Mrs. Claus. She wears glasses to prove that she is smarter than me. She is short and sweet, like my writing should be. She wears red, like the pen that she is marking my text with. Her clothing is impeccable, like her editing skills. But where can I send Mrs. Claus when she gets in the way of me finishing a first draft? Well, I think I will send her to the North Pole. Maybe she can reunite with Mr. Claus. She can correct the elves' grammar and proofread the toys' instruction manuals until I actually need her. Goodbye Mrs. Claus! I will need your help soon, just not right now. Oh, and thanks for publishing that poem I wrote as an 8th grader. I didn't appreciate it then but you made me believe that I could be a writer someday. Thank you for that. What does your inner critic look like? Ninja Writer Challenge Starts Tomorrow! 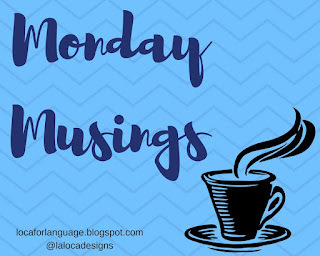 I am starting a new writing challenge tomorrow. I already have my new notebook, a pen that brings me joy, and I've listed the challenge goals on the first page. 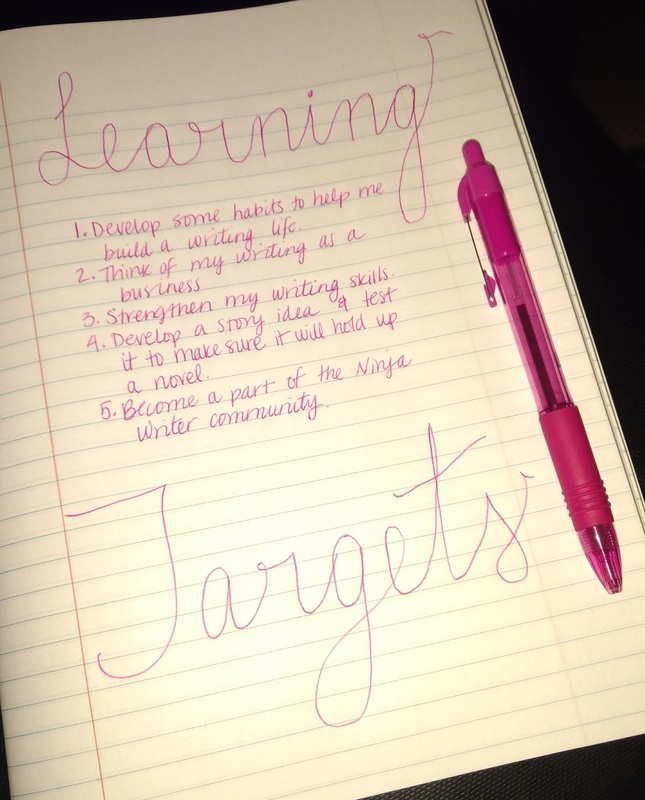 I really like having goals for a new notebook. From what I can gather, the challenge should require about 30 minutes of my time each day during the month of May: 10 minutes of writing, 10 minutes of reading, and 10 minutes for the daily challenge. I am excited to start this challenge (I am always excited to start a challenge); my concern is that, as usual, I will not complete the challenge. I am hopeful that I can follow through with this challenge - 30 minutes a day seems like such a small commitment. Dear reader, I would love a gentle nudge to help me stay on track. If you are interested in joining the challenge and becoming my writing buddy, visit this link. I look forward to a month of writing with you. 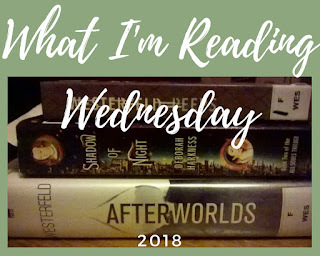 Well, my reading year was off to a great start but I am definitely slowing down. 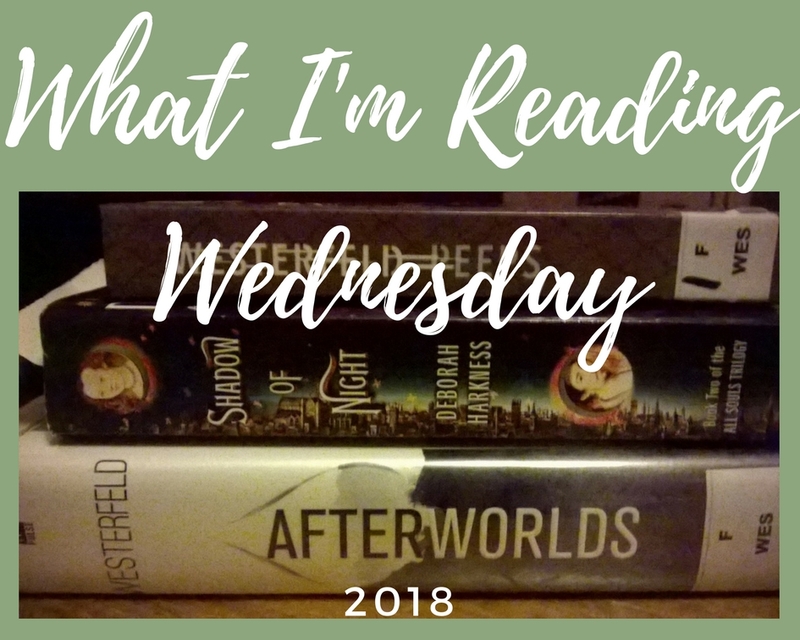 With only five days left, I have one and half books left to read in order to complete Erin's book challenge. I know that I can do it, if I really focus and read. The question is, will I do it?